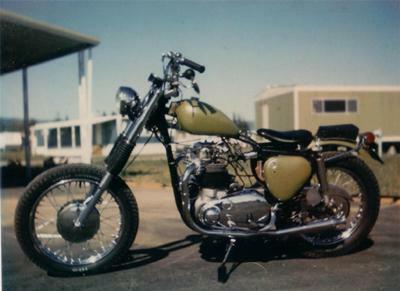 A 1960 BSA Chopper (A-10): This is another one of my projects from back in The Day. I hung out at Collins Cycle Shop when I was a teenager, and Jerry helped me find and learn to build these bikes. It's a typical example of several of the bikes we built from these old Brit bikes in those days (ca. 1968), and pretty typical of "The Look" that was popular with them in our area. Paint, chrome, peanut tank, forks stretched 6", bobbed, but not really "radical." It was a real dependable little scooter, and I rode it for a year or so before I finally sold it and moved on to the next project. This one's a 1960 A-10 pre-unit 650cc model. You did a great job, that bike is perfect and dialed in! If they made the old Trumpy now I would buy it, I just have fun biking, I don't need 85 MPH!